Malnutrition is a condition in which a person's diet is inadequate to meet minimum daily requirements for nutrients such as proteins, fats, vitamins, and minerals. It is caused by one of two factors. First, a person simply may not get enough food to eat and, thus, fails to take in the nutrients needed to remain healthy. Someone who is hungry all the time obviously is not eating enough food to remain healthy. Second, a person may eat a limited diet that fails to deliver vital nutrients to the body. Anyone who tries to survive on a diet consisting of potato chips, candy bars, and sodas will not be getting the complete range of nutrients his or her body needs. The single most important factor that leads to malnourishment is poverty. Vast numbers of people who live in less-developed countries of the world either do not get enough to eat or do not eat the correct foods. Those who are most at risk of malnutrition where conditions of poverty exist are infants, children, pregnant women, and the elderly. Malnutrition is not restricted to less-developed nations, however. Even countries with high standards of living, such as the United States, have their share of poor people who are underfed or poorly fed and may develop malnutrition. According to some estimates, at least 20 million Americans go hungry periodically within any given month. Throughout the world, the death toll from malnutrition caused by hunger is estimated to range from 40,000 to 50,000 people a day. 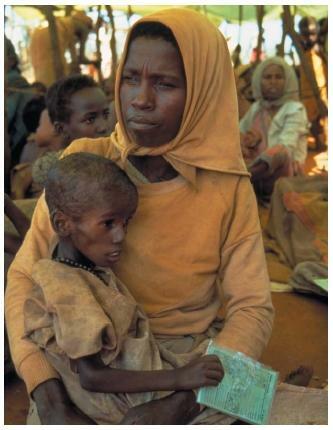 An additional 450 million to 1.3 billion people face the prospect of starvation from their limited food supplies. Elderly people in nursing homes or hospitals suffering from long-term illnesses or chronic metabolic disorders (which affect the way one's body processes food for energy) are also at risk for malnutrition. Health professionals have procedures to monitor the nutritional condition of these individuals. Malnutrition is also experienced by those suffering from a condition called anorexia nervosa, a disorder marked by a person's intentional refusal to eat properly that can lead to starvation. The human body requires a wide range of nutrients in order to remain healthy, grow normally, and develop properly. These nutrients include carbohydrates, fats, proteins, vitamins, and minerals. Other substances, such as water and fiber, have no nutritional value but are needed to maintain normal body functions. Bone marrow: The spongy center of many bones in which blood cells are manufactured. Dermatitis: An inflammation of the skin that is often a symptom of a vitamin deficiency disorder. Edema: An abnormal collection of fluids in the body tissues. Hemolytic anemia: A type of anemia caused by destruction of red blood cells at a rate faster than which they can be produced. Kwashiorkor: A protein-deficiency disorder found among children characterized by wasting, loss of hair and skin pigmentation, anemia, blindness, and other symptoms. Marasmus: A protein- and calorie-deficiency disorder characterized by the wasting away of muscle and skin in children. Night blindness: Inability to see at night often caused by a vitamin A deficiency. Nutrients serve a number of functions in the human body. Carbohydrates and fats, for example, are used by the body to produce the energy humans require to stay alive and healthy and to grow and develop normally. Proteins are used in the production of new body parts, to protect the body against disease and infection, in the regulation of bodily functions, and in a variety of other ways. Vitamins and minerals are used in the body for a number of different purposes, such as controlling the rate at which many chemical changes take place in the body. Overall, more than 50 different nutrients are needed to keep the human body healthy. The absence of any one of these nutrients can result in the development of a nutritional deficiency disease. Some common nutritional deficiency diseases are discussed below. Kwashiorkor and marasmus. Kwashiorkor (from the West African word for "displaced child") is a nutritional deficiency disease caused when infants and very young children are weaned from their mother's milk and placed on a diet consisting of maize flour, cassava, or low-protein cereals. That diet is generally high in calories and carbohydrates, but low in protein. The most striking symptom of kwashiorkor is edema, a bloating caused by the accumulation of liquids under the skin. Other symptoms may include loss of hair and skin pigmentation, scaliness of the skin, and diarrhea. As the disease progresses, a person may develop anemia (a disorder in which a person's red blood cell count is low and they lack energy), digestive disorders, brain damage, a loss of appetite, irritability, and apathy (lack of interest in things). Most children do not die of kwashiorkor directly. Instead, they develop infections that, if left untreated, can be fatal. They die from measles, the flu, diarrhea, or other conditions that could be treated relatively easily in a healthy child. Marasmus (from the Greek word for "to waste away") is a more severe condition than kwashiorkor. It results when a person's diet is low in both calories and protein. The disease is characterized by low body weight, wasting of muscle tissue, shriveled skin, and diarrhea. The most prominent feature of marasmus is a severely bloated belly. A child with marasmus has the appearance of an old person trapped in a young person's body. Scurvy. Scurvy is one of the oldest deficiency diseases recorded and the first one to be cured by adding a vitamin to the diet. It was a common disease among sailors during the age of exploration of the New World. Portuguese explorer Vasco da Gama (c. 1460–1524) is said to have lost half his crew to scurvy in his journey around the Cape of Good Hope at the end of the fifteenth century. The main symptom of scurvy is hemorrhaging, the heavy discharge of blood that results when a blood vessel is broken. The gums swell and usually become infected. Wounds heal slowly and the bleeding that occurs in or around vital organs can be fatal. The disease is slow to develop and its early stages are characterized by fatigue (tiredness), irritability, and depression. In the advanced stages of the disease, laboratory tests will show an absence of the vitamin needed to protect against the disease. In 1747, a British naval physician, James Lind (1716–1794), discovered the cause of scurvy. He found that sailors who were given oranges, lemons, and limes to eat along with their regular food did not develop scurvy. In spite of this finding, it was not until the end of the eighteenth century that the British navy finally had its sailors drink a daily portion of lime or lemon juice to prevent scurvy. The American slang term for English sailors, "limeys," originated from that practice. The active ingredient in citrus fruits that prevents scurvy was not discovered until the 1930s. Then, two research teams, one headed by Hungarian-American biochemist Albert Szent-Györgyi (1893–1986) and the other by American biochemist Charles G. King, found that the antiscurvy agent in citrus fruits is a compound now known as vitamin C.
Beriberi. Beriberi is a disease that occurs widely in China, Indonesia, Malaysia, Burma, India, the Philippines, and other parts of Asia and the South Pacific Ocean. It is characterized by edema (accumulation of water in body tissues), fatigue, loss of appetite, numbness or tingling in the legs, and general weakness of the body. In fact, the name beriberi comes from the Singhalese word for "weakness." Beriberi is caused by an absence of vitamin B 1 (thiamine) in the diet. The disease can be prevented by eating foods that are rich in this vitamin, foods such as meats, wheat germ, whole grain and enriched bread, legumes (beans), peanuts, peanut butter, and nuts. Pellagra. The symptoms of pellagra are sometimes referred to as the "three Ds": diarrhea, dermatitis, and dementia. Dermatitis refers to skin infections while dementia means deterioration of the mind. If the disease is not treated, it may lead to death. The cause for pellagra was discovered in the early twentieth century by Joseph Goldberger (1881–1929), a member of the United States Public Health Service. Goldberger established that pellagra is caused by an insufficient amount of niacin (vitamin B 3 ). Niacin occurs naturally in foods such as liver, meat, fish, legumes, and dried yeast. Today it is added to many processed foods such as bread, flour, cornmeal, macaroni, and white rice. This practice has essentially eliminated pellagra as a medical problem in developed countries, although it remains a serious health problem in some less-developed countries of the world. Rickets. Rickets is a bone disorder caused by a lack of vitamin D. Vitamin D is often called the "sunshine" vitamin because it can be produced in the human body by the effects of sunlight on the skin. Rickets was once a common disease of infants and children. However, all milk and infant formulas now have vitamin D added to them. Thus, the disorder is rarely seen today in countries where "fortified" milk is available. Symptoms of rickets include legs that have become bowed by the weight of the body and wrists and ankles that are thickened. Teeth may be badly affected and take a longer time to mature. Other vitamin deficiency diseases. The most common problem associated with a deficiency of vitamin A is night blindness. Night blindness is the inability to see well in the dark. Vitamin A is needed for the formation of a pigment needed by the eyes for night vision. Another eye disease caused by vitamin A deficiency is xerophthalmia, which can lead to blindness. This condition affects the cells of the cornea, other eye tissues, and the tear ducts, which stop secreting tears. Vitamin A deficiency is also responsible for a number of skin conditions, problems with tasting and smelling, and difficulties with the reproductive system. Important sources of vitamin A that can protect against such problems include fish-liver oils, butter, egg yolks, green and yellow vegetables, and milk. Vitamin E and K deficiencies are rare. A deficiency of vitamin E may be related to sterility (inability to have children) and to more rapid aging. Vitamin K promotes normal blood clotting. Vitamin B 12 (cobalamin) provides protection against pernicious anemia and mental disorders. Vitamin B 6 also protects against anemia as well as dermatitis, irritability, and convulsions. Mineral deficiency diseases. About 25 mineral elements are required in the human body for the maintenance of good health. Calcium and phosphorus, for example, are needed to produce teeth and bones. Diseases resulting from the lack of a mineral are relatively rare among humans. One of the exceptions is the disorder known as goiter. Goiter is a condition caused by an insufficient amount of iodine in the diet. Iodine is used by the thyroid to produce hormones that control the body's normal functioning as well as its normal growth. If sufficient iodine is not available in a person's diet, the thyroid gland begins to enlarge its cells in an effort to produce the needed hormones. This enlargement produces the characteristic swelling in the neck characteristic of goiter. Today, goiter has virtually disappeared from most developed nations because of the practice of adding small amounts of iodine (in the form of sodium iodide) to ordinary table salt. Perhaps the most common of all mineral deficiency disorders is anemia. The term anemia literally means "a lack of blood." The condition is caused when the number of red blood cells is reduced to a level lower than that necessary for normal body functioning. The human body gets the energy it needs to stay alive and function normally by oxidizing nutrients in cells. The oxygen needed for this process is carried from the lungs to cells on red blood cells. The "working part" of a red blood cell is a complex molecule called hemoglobin. Each hemoglobin molecule contains a single atom of iron at its center. The iron atom combines with oxygen from the lungs to form a compound known as oxyhemoglobin. It is in this form that oxygen is transferred from the lungs to cells. If the body fails to receive sufficient amounts of iron, an adequate number of hemoglobin molecules will not be formed. In that case, there are not enough functioning red blood cells to carry all the oxygen that cells need to produce energy. A person becomes weak and listless and may suffer headaches, soreness of the mouth, drowsiness, slight fever, gastrointestinal disturbances, and other discomforts. More than 30 different forms of anemia have been recognized. These forms may result from a wide range of causes. For example, a person who has surgery may lose enough blood to develop anemia. A form of anemia known as aplastic anemia develops when bone marrow is destroyed by radiation, toxic chemicals, or certain types of medication. Loss of bone marrow inhibits the production of red blood cells. Hemolytic anemia is caused by the rupture of red blood cells, a problem that can be caused by hereditary factors or by toxic agents. The treatment for malnutrition and for nutrient deficiency diseases is obvious: a person who lacks adequate amounts of food or fails to eat the right kinds of food must change his or her diet. That instruction is easy to give but in many parts of the world it is impossible to follow. Marasmus, kwashiorkor, beriberi, scurvy, rickets, and other deficiency disorders are common in less-developed countries of the world because sufficient food is either not available or, if it is, it is not sufficiently nutritious. In more-developed countries of the world, people often have ready access to nutritious foods in sufficient quantities so that malnutrition is less of a problem than it is in less-developed countries. In addition, a very large variety of supplements are available, such as vitamin and mineral pills. Anyone who fears that he or she may not be receiving enough of any given vitamin or mineral can easily supplement his or her diet with products available at the corner grocery store. My name is Don and I am a Canadian living in Guatemala, I am certain I can stop malnutrition. I have lived here close to 8 yrs. now and I have a hard time to believe people die of malnutrition. If this interests you and you would like to help, or know of someone, please contact me or give them this email.. No one in this day and age should be without food, especially children. One of the newspapers in Guatemala, The Prensa Libre says 150,000 families with malnutrition this year. This not right. Please help with this worthwhile project.